Data traffic is growing at unprecedented rates, fueled increasing mobility, users on multiple devices and the need to access cloud applications. First Communication’s CloudConnection can help you move to the cloud seamlessly and confidently. This private connection allows your business to enjoy easy, safe and fast access to the cloud while reducing latency and maximizing performance. As you move your business applications to the cloud, First Communications can provide you with faster access to cloud providers with decreased latency and more consistent network performance. CloudConnection provides quick and easy access to over 500 cloud providers including Microsoft Azure, Saleforce.com, IBM Softlayer, and Amazon Web services. Your dedicated, high throughput connection provides premium network performance and speeds with a 99.999% uptime SLA. 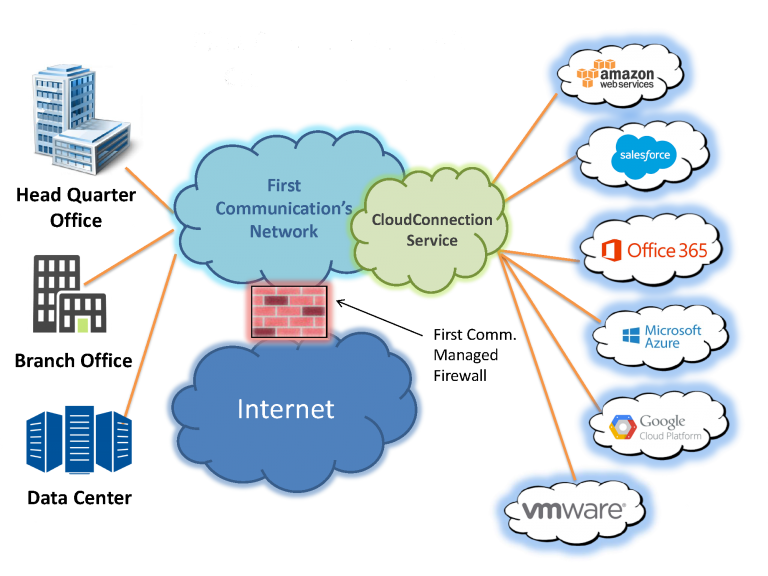 CloudConnection’s secure connection between the First Communication network and the cloud protects your company by eliminating your private data from being routed over the Internet.